First I want to make a BIG compliment. I just changed my beloved treo 650 for a HTC Desire HD. I didn't want all my private data all over google. I was getting desperate for a good calendar without the use of google...until dejaoffice calendar! It is almost like I have my treo calendar back. Just one little request: Can you give us an option to change the color of the appointment boxes. The colors of the headers are very soft pastel like colors and the black is very hard and dominant. Changing the settings to a black background and white boxes is even worse. We will be evaluating color schemes and artwork in future releases. We hear the request. So glad we could help with your beloved Palm Desktop and Calendar experience! The calendar appointments show up black by default because the colors are reserved for categories. 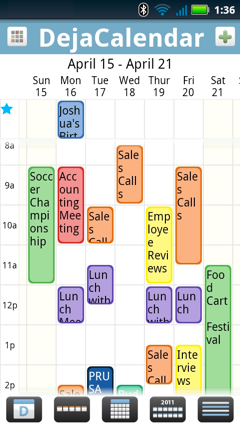 For example, this screenshot shows a weekly calendar with appointments made under a few different categories. To get your calendar looking like this, you'll have to edit each appointment and set a category. You can manage categories and colors by tapping the Categories app from the DejaOffice home screen. Yeah, dumm me! After I wrote this I kept on trying several things and stumbled on it. I am not a great computer user since my husband is in ICT. that makes me a bit lazy. This time he said I had to try and do my phone myself to learn the basics. And he is right! I am proud on the things I already did on my own, but there is still a lot to learn. I have used palmdesktop for 7 years now and I never did categorise my appointments because I do use my calendar only for my own appointments. But just two questions: is it possible to set the default setting of no categorie to personal or business or Lexie. This way I would still be able to add an appointment quick and you always have the same color you want until you categorise it differently. And is there a way to change all the 'no categorie' to, for example, personal without to having to do it for every entry single handed. I am very happy with your software and the similarities with Palm Treo are great. It is not just the conveniance of using the same kind of software but we were always Palm fans because of their good standard. Before my treo I had a Palm PDA I inhereted from my husband. The Treo was my own choice and my first new bought phone because I was fed up with having ánd a Nokia ánd a PDA in my bag. So I bought the companionlink software and am a happy customer.